As sure as the number of people with colds and flus is bound to spike during the fall and winter seasons, so are sightings of Mucinex commercials. Indeed, recent data from YouGov BrandIndex confirms the cyclical nature of the cold and flu medication’s advertising efforts. 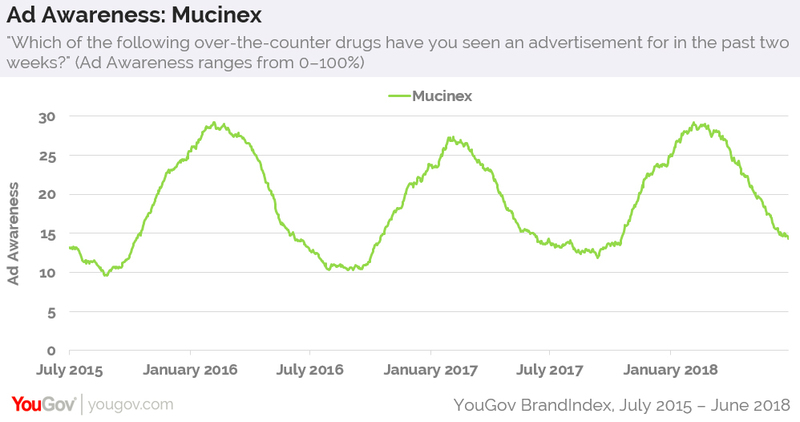 Throughout the past few years, the amount of Americans who have come across a Mucinex ad has dropped to a low of 10% during the warmer months, according to its Ad Awareness score, which measures how many US consumers recall seeing an advertisement for a particular brand in the past two weeks. As the temperature drops, this percentage nearly triples. During this past cold and flu season, however, the over-the-counter medication experienced an atypical boost among consumers. 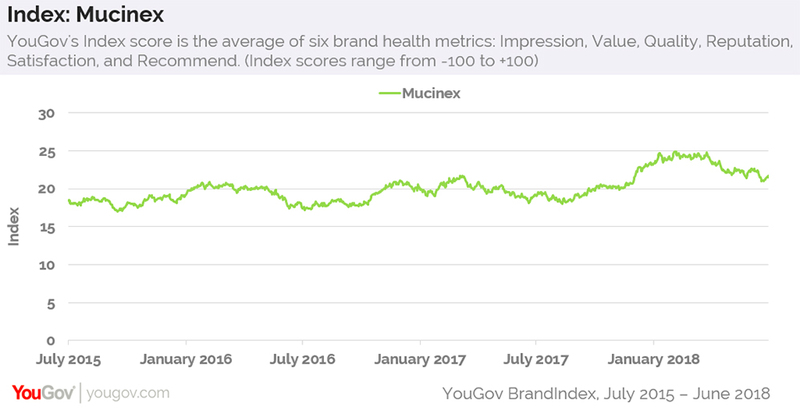 During the winter of 2018, Mucinex’s Index score — which calculates the average of six YouGov brand health metrics, from Quality and Value to Reputation and Satisfaction — hit a high of 25 on multiple occasions. In recent years, Mucinex hasn’t been able to reach a score of 22. This lift in sentiment toward the brand correlated with a rise in potential sales. 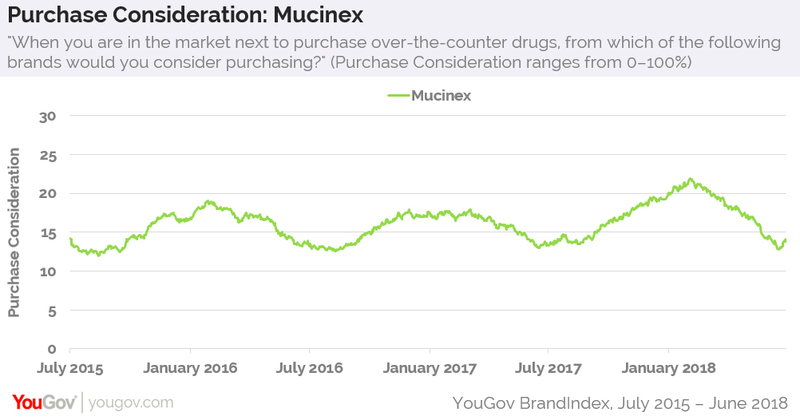 Mucinex’s Purchase Consideration score — which gauges how open the public is to buying a specific good or service — shows that, in early February, 22% of shoppers said they'd consider getting Mucinex when next in need of an over-the-counter drug. It’s the highest Purchase Consideration score for Mucinex in the past few years. According to data from YouGov Profiles, 81% of current and former Mucinex customers indicate that they usually take a pharmacist’s advice when buying over-the-counter medicine, compared to 74% of the general public. Furthermore, 50% of current and former Mucinex customers state that they often take non-prescription medicine as soon as they get sick. The same is true for 47% of all US adults.